Beautifully scenic golf courses come in all shapes and sizes, while there are many global golfing locations where the score you post becomes irrelevant such is the sheer beauty laid out before you. Here at Hole19 HQ, we've been kicking around our ideas of what makes a great golfing backdrop and considering the most scenic golf courses in the world. With that in mind, here's a short collection of our personal favourites. Set against the backdrop of the beautiful Mountains of Mourne, the host venue of the 2015 Irish Open provides a true test of links golf. The mountains themselves provide picture-postcard scenery and are listed as an 'area of outstanding natural beauty' - high praise indeed. If you were looking for the best golf course in Northern Ireland, it would be a toss-up between Royal County Down and Royal Portrush on the North Antrim Coast. The awesome backdrop tilts our vote in favour of the former. 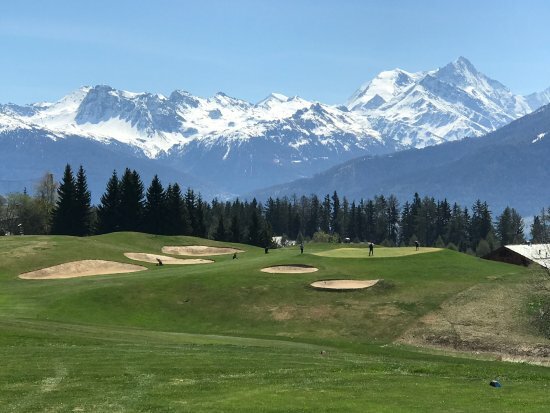 With the Swiss Alps towering majestically above, Crans-Sur-Sierre could be just about the most beautifully serene setting for any golfer to experience. Upon the 7th tee, while the crisp, cold air swirls, you are greeted by probably the best panoramic view in golf. Snow-capped mountains of gargantuan stature, and the Rhone Valley which flows through their valleys, really do serve up an incredible scene. This has got to be in the running for the most scenic golf course in the world. OK, so the annual home of The Masters doesn't have the draw of mountainous terrain as a backdrop, nor does it have the undeniable allure of a coastal setting - we get that. With that said, Augusta National is well known for its tall, imposing trees and vibrant azaleas which create a truly stunning spectacle and help bring the year's first major championship to life. As a case in point, the course's 12th hole is often voted as the most beautiful par-3 in world golf, while Golf.com have stated their belief that the par-5 13th is out on its own as the most stunning inland hole on the planet. Set within the outstanding beauty of New Zealand's Matauri Bay, Kauri Cliffs is well known for its idyllic cliff-top setting and undoubtedly challenging nature. The undulating hills overlooking the Pacific, and the majestic landscape throughout, provide an utterly breathtaking backdrop. The par-3 7th hole includes a spectacular panoramic view rocky islets and the wide expanse of the Pacific Ocean beyond. 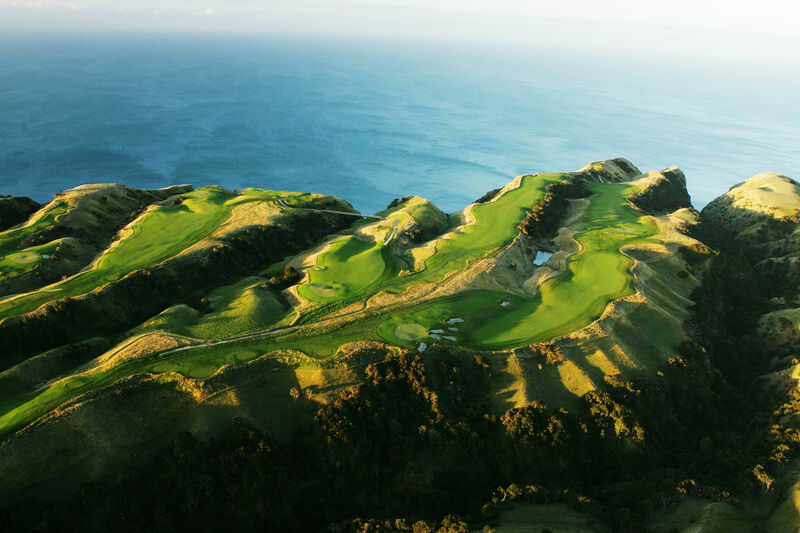 There would be few more visually stunning golfing experiences than that on offer at Kauri Cliffs. Vale do Lobo get's a place on our list thanks, in no small part, to the visual treat provided on the 16th hole of its Royal Course. The clay cliff-top setting is beautifully enhanced by spectacular blue waves below, which roll and break against stunning white sands. If the wind gets up, it's a bit of a brute of a golf hole too. With cliff-top views of the rolling seas of Hawkes Bay, Cape Kidnappers provides an extremely dramatic setting for golf lovers. Its rugged terrain tilts towards the sea and, though technically not a links course, it helps serve up seaside golf at its finest. On the sixth and fifteenth holes, it is possible that a wayward approach shot may fall off the very edge of the Earth - in golfing terms at least. Which courses spring to your mind when thinking of the best golfing backdrops? Any obvious stunners we have missed out? Let us know below.